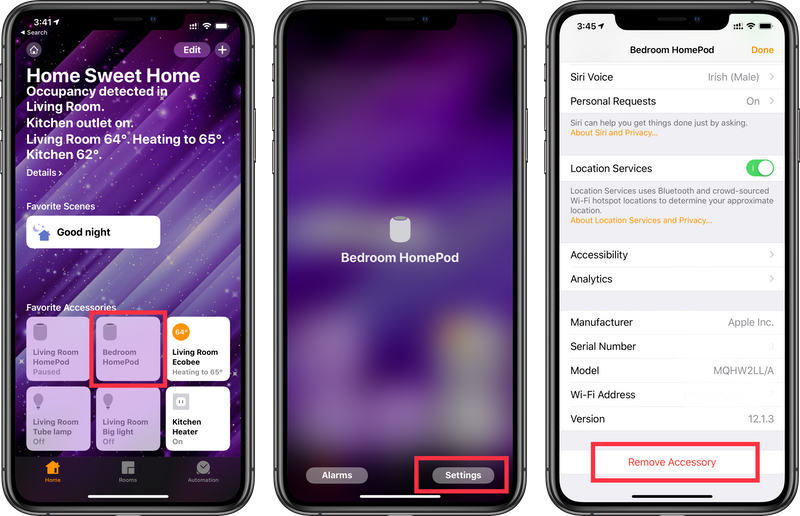 If you want to get rid of a HomeKit device or remove it from your HomeKit setup, Apple has made doing so very easy. Press and hold the icon of the accessory you want to remove. Scroll to the bottom and tap on Remove Accessory. Scroll down to the bottom and click Remove Accessory. Note that many smart devices can only be associated with one user account at a time. If you sell or give away a device, its new owner may need to take extra steps to set it up unless you deregister it from any associated manufacturer account and delete it from your Home app before it can be used in their own home. For example, the iHome iSP6 smart plug's instructions direct you to create an iHome account and use the iHome app to set it up. If you do this, your smart plug is associated with your iHome account and it can't be associated with another iHome account unless you remove it from yours. Its new owner can reset it to factory settings to work around this, though, so not all is lost.